To celebrate the 150th anniversary of the birth of Claude Debussy, writer & pianist Roy Howat [standing] was joined by Peter Sheppard Skærved [violin] and Neil Heyde [cello, R] for a public seminar exploring the young composer’s first essays in the field of chamber music: the Piano Trio of 1880 and two cello pieces of 1882. This workshop was spontaneous and natural, talk amongst themselves, with the audience privileged listeners, enjoying quite esoteric discussion and alternative playings of controversial passages. It provided a window into the mysteries and attractions of research detective work and analysis of findings. The musicians/academics illustrated the complexities and challenges of preparing Roy Howat's forthcoming new edition for the Oeuvres completes de Claude Debussy, demonstrating to the most receptive of us how editorial rethinking can sharpen our perception of these still little-known works, and of Debussy’s skills as a young composer, very different from the familiar one of his later life. A rewarding afternoon, as are so many at RAM, which attracted some 70 people to pack the piano gallery. Is there a right way of playing a composer's music? 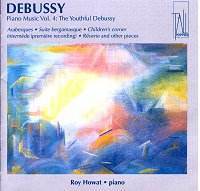 Roy Howat has a magnificent track record as a French music scholar, and as a stylist in its interpretation (Chabrier as well as Debussy). 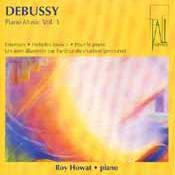 Pieces of Debussy are still being discovered, not least by Howat himself, and this disc has a musicological highlight, a first recording of Debussy's tribute to his coalman, whose generosity kept him warm in the winter of 1916-7. Howat's playing is intentionally faithful, admirably clear and intellectually transparent in his interpretations. But if we listen to a great pianist play Debussy - say Michelangeli, Richter, or Gieseking - we equally hear the music work not only as impressionism but also pianism. Maybe fireworks, maybe poetry. When, in that famous phrase, we hear that the piano no longer has hammers it is not because of some careful stylistic respect, but because the master pianist is a magician of the sound-world. We are exalted in ways that Howat, sadly, does not come near. Perhaps, as a performer, Debussy himself could not achieve this, but his interpreters must strive to. If you are seriously interested in Debussy and his piano music, get these CDs (there are four of them) from Tall Poppies and make up your own mind about these opposed responses and tell Musical Pointers?